Murder by Gaslight: 19th Century Serial Killers. There seems to be an ongoing debate on the question of who was America’s first serial killer. Often the names H. H. Holmes and the Bender Family are mentioned as the first, but both of these suggestions are wrong by decades. At Murder by Gaslight, we are not concerned with who was first since we are only interested in the 19th Century and serial killers have always been with us. The other debate around serial murder is how to define it. For simplicity we will use the definition agreed upon at a serial murder symposium sponsored by the FBI’s National Center for the Analysis of Violent Crime: “The unlawful killing of two or more victims by the same offender(s), in separate events.” This differs slightly from a federal law which defines serial murder as “three or more killings,” but, as we shall see, two murders are usually enough to identify the problem. In both definitions motivation was intentionally omitted to avoid complexity. 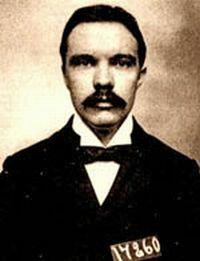 1895 Theo Durrant Known as “The Demon of the Belfry” Theo Durrant raped, murdered and mutilated Blanche Lamont in the Emanuel Baptist Church on April 3, 1895. Nine days later he did the same to Minnie Williams. Durrant was captured and executed before he could kill more. 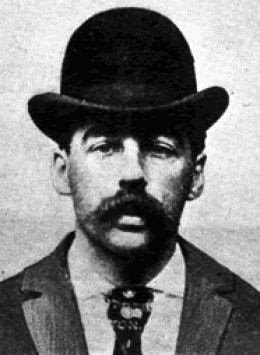 H. H. Holmes Herman Webster Mudgett, better known as H. H. Holmes, may have murdered many as 230 people between 1888 and 1894. While only convicted of one murder, Holmes confessed to killing 27 and police believed he burned, asphyxiated and tortured many times that. 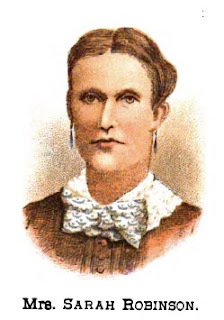 1885 Minnie Wallace Walkup While never convicted, it is believed that Minnie Wallace Walkup poisoned her first husband James Reeves Walkup, her second husband John Berdan Ketcham, and her companion Delancy Horton Louderback. 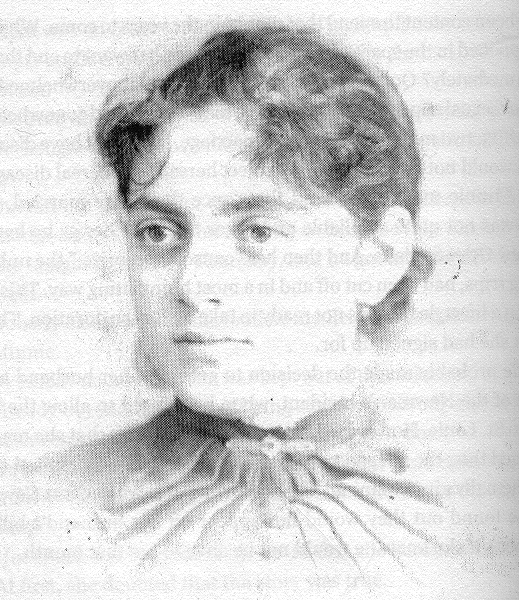 1881 Sarah Jane Robinson Sarah Jane Robinson, “The Massachusetts Borgia” poisoned her husband, her children, her sister, her brother-in-law, her nephew, and her landlord between 1881 and 1886. 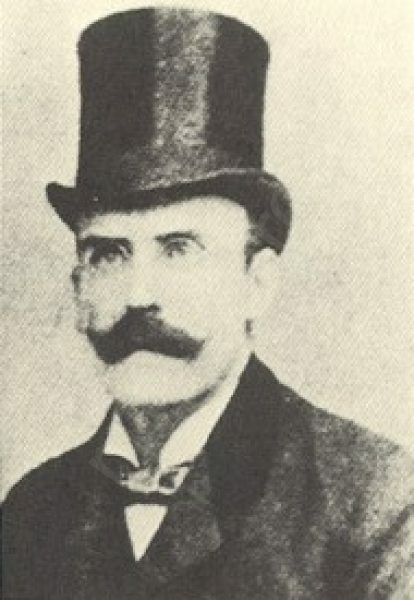 1881 Dr. Thomas Neil Cream Cream was convicted of one murder in Chicago and was suspected of poisoning several more in the U.S. before moving to London. There he was known as “The Lambeth Poisoner” after he poisoned at least two prostitutes with strychnine. Some have speculated that Cream was Jack the Ripper. 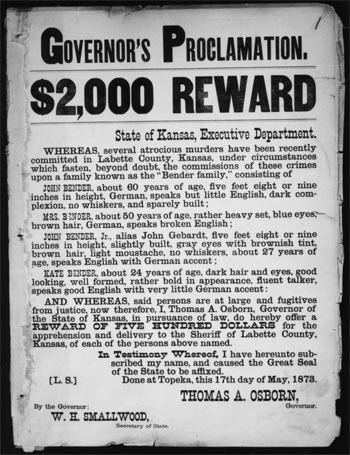 1879 Bender Family The “Bloody Benders” murdered at least 10 people in Kansas between 1870 and 1873. Visitors were lured to their farmhouse where they operated a small restaurant. While guests dined, the male Benders would hit them from behind with hammers, rob them and bury their bodies in the yard. 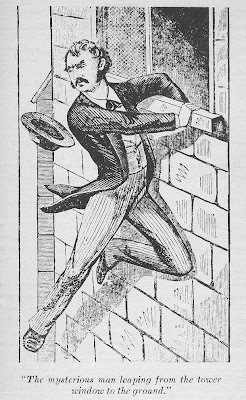 1875 Thomas W. Piper After being convicted of murdering 5-year-old Mabel Young in the belfry of the Warren Street Baptist Church in Boston, Thomas Piper confessed to murdering Bridget Landregan and Mary Tynam and attacking Minnie Sullivan. 1875 Joseph Lapage 17-year-old Josie Langmaid was raped, murdered and decapitated on her way to school in Pembroke, New Hampshire, by Joseph Lapage. Before his execution, Lapage confessed to a similar murder in St. Albans, Vermont. His sister-in-law testified that Lapage, wearing mask, had threatened her with a club and raped her. 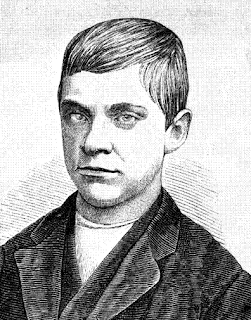 1874 Jesse Pomeroy When only 14 years old, Jesse Pomeroy stabbed and mutilated 10-year-old Katie Curran. Four days later he murdered 4-year-old Horace Millen. Prior to the murders, Pomeroy had bound and tortured 7 children. Pomeroy was convicted of murder and spent the next 53 years in prison. 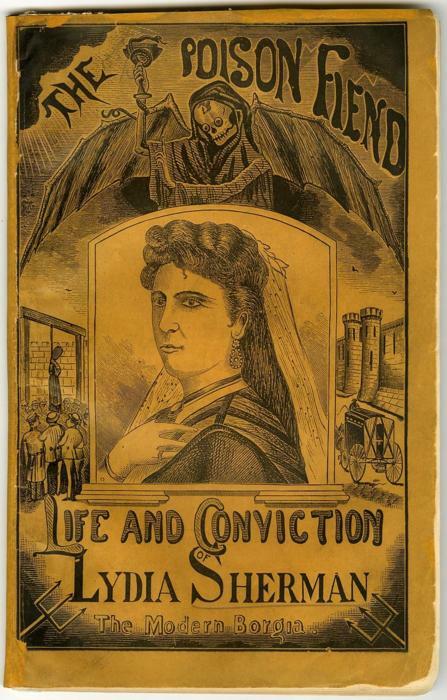 1864 Lydia Sherman Between 1864 and 1871, Lydia Sherman poisoned 3 husbands and 7 of her children. She was convicted of 2nd degree murder and died in prison. 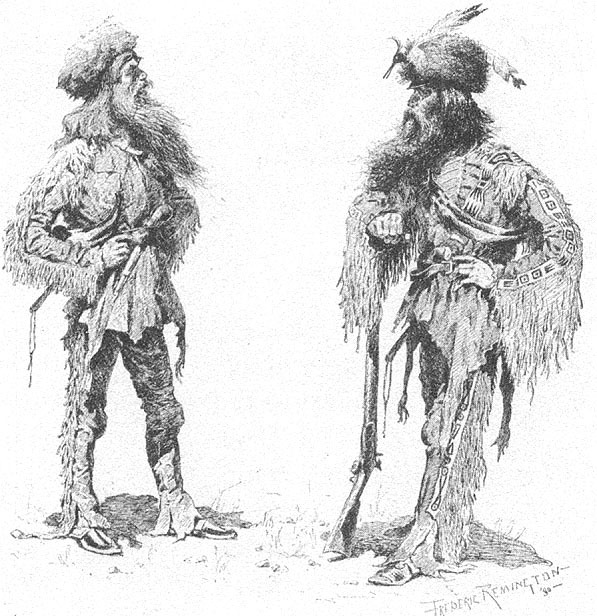 1798 Harpe Brothers In 1798 the Harpe Brothers “declared war on all mankind” and murdered between 25 and 40 men, women, and children in Tennessee and Kentucky. Though they operated in the 18th century, they are included here because the Harpe Brothers are probably the earliest recorded serial killers in America. No doubt, earlier serial killers will be found. Very interesting site. I came across it while searching for information on Pearl Bryan after listening to a podcast about her. I am fascinated by historical criminals and social history in general, so much so I regularly read nineteenth century newspapers online and compile the best news items into books. I concur with these findings. 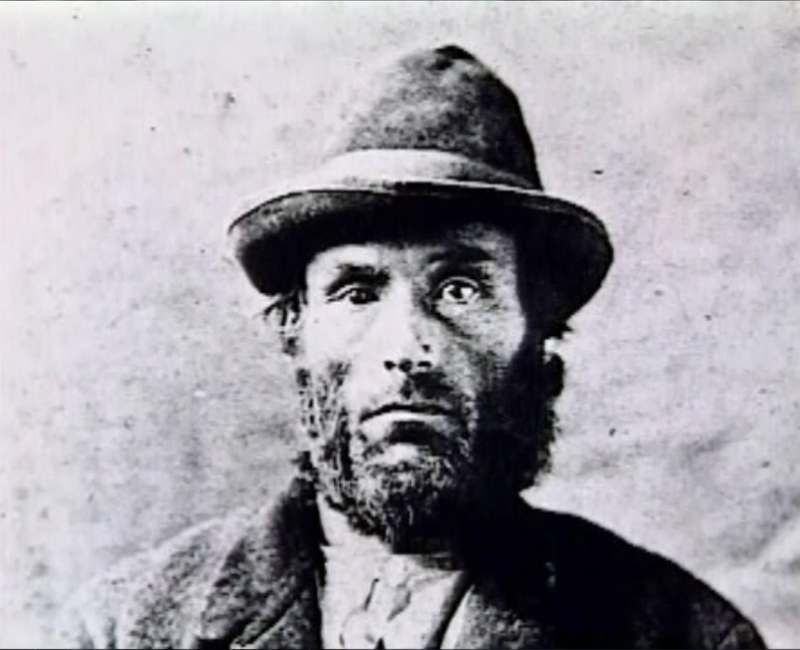 Whilst researching American serial killers (as well as serial killers in general), I came across many investigative resources and historical evidence purporting that the Harpe brothers were- so far as these outlets could deduce from information that was available to them at the time- the first serial killers operating in North America. However, what is rarely mentioned is that the Harpe brothers' "wives"/children's mothers were in all likelihood accomplices to, at least, some of these homicides. Although, they ("wives"/children's mothers) were all found "Not Guilty" at trial- there is very little doubt that some or all of those females were actually Guilty of the crimes of Aiding and Abetting the Harpe brothers, or at the very least Guilty of Obstruction of Justice, Perjury and Withholding evidence of felonies. I found an earlier serial killer thanks to Michael Newton. Samuel Frost (1765 - October 31, 1793) randomly beat his father's head in for no apparent reason on September 24, 1783. Acquitted due to being mentally unstable, he was placed in the care of Captain Elisha Allen. He bashed his head in too on July 16, 1793. This time, he didn't get off the hook. He was hanged on October 31 of that year, in front of a cheering crowd. Works for me, Okiku. Where did Frost live?